The symbol of Biarritz, this statue enjoys a dramatic and beautiful location. Surrounded by water and crashing waves, the statue of the Virgen enjoys a dramatic location. You can walk out to it along the beach path and across a metal footbridge. Be sure to enjoy the views in all directions, including down in the water where you'll see a lot of fish and other marine activity. 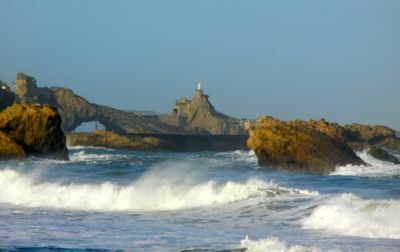 According to history, Napoléon III decided to use this rocky point as an anchor point for the port. It was originally connected via a wooden footbridge, which was later replaced with a metal bridge. Just behind the Rocher de la Vierge is the impressive Musée de la Mer and Cité de l'Océan, with nearly 50 aquariums and interactive exhibits about ocean life. 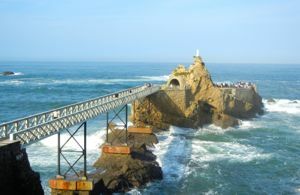 Above, Bridge to the Rocher de la Vierge, Biarritz.